A resume can never fully showcase the extent of your writing and publishing career, especially for freelancers. You didn’t just complete a series of writing jobs; rather, you built your own business. You probably can’t even fit all your projects on one page, but here’s what you should highlight. Highlight your most impressive work experience rather than delivering a laundry list of as many gigs as you can fit on the page. Employers and new clients would rather see a high profile company you worked for, even if the project was less important, over a more intensive project for a small business. Pick writing projects or clients that are most relevant to the job you're applying for. If you are not certain about the details of the role, you may want to include a diverse mix of clients and projects. That way, you can show your comfort with a variety of roles. Consider including a text box with a testimonial from an appreciative client. Optionally, you can use a summary section to describe your career or day-to-day work. You can also use this section to highlight qualifications that make you a good for the role you are applying for. Include facts and figures when you can. If you wrote content for a website that gets a million hits per month, that grabs attention. Did your new content for a website increase page views by 50 percent, or did your blog for a client attract 4000 new members to the site? If you wrote a book, you might want to share the rating from review sites like Goodreads. Express action-oriented results when possible. Don't overload your writing examples with excessive detail, and avoid overused and cliched words like professional, creative, driven, and detail-oriented. Include a few links to your best writing samples. Or, alternately, you can include a list of publications where you provided editing or wrote content. Present your whole self, not just your writer self. An employer is hiring a human with an array of interests, likes, and experiences, not a bot that churns out content. Include a section on other interests to connect with clients on a personal level. For some writing jobs, this can be a significant part of your resume. Direct readers to your website where they can find writing samples, a client list, testimonials, and awards. If you do not have testimonials, consider asking clients who have complimented your work to provide comments/reviews you can share on your website. Viewing feedback from other clients is very compelling to people considering hiring you. On your website, include links to your social media accounts (only if you have a professional presence) where your personality and creativity shine through, and if you think it will enhance a prospective employer's opinion of you. In some fields, a high follower count is a plus for editors seeking writers. If you have an impressive number of followers on social media, you can mention that on your resume (and in cover letters, too). If you do not have a website, look for free services that allow you to easily establish an online portfolio of your work. For people seeking jobs in the publishing industry or as writers, it's particularly important for materials to be free from any errors. 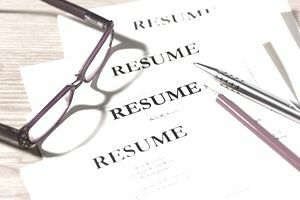 Print out a copy of your resume and review it carefully for typos, grammatical errors, and formatting mistakes. As well, take a close look at your website and social media accounts to make sure they are not full of errors. Before you start working on your resume, review resume examples to get ideas for how to write and format your own. Here are writing and publishing related resume examples that you can use as a springboard to tailor your own experience, achievements, and skills.